MEDVEDEV SPEECH. He gave his annual speech to parliament last week. As is customary he started with achievements. Quite a list in fact: improvements in the economy overall, in the demographic situation, poverty reduction, military improvement. All true enough, albeit presented as positively as possible. But, in the present situation, his proposals for political reform are the most interesting. And, given the continuing existence of The Team, we may assume that these have Putin’s approval and will become law. The principal ones – and, he said, more will be coming – are the return to direct election of regional heads, the creation of a proportional voting system for districts (sounds like a return to the previous system of half individual representative and half party vote) and the reduction of the numbers of signatures required to register a party or presidential candidate. Instructions were given to the government and a bill on the last was sent to the Duma. The condition for candidates and parties to produce millions of signatures was inherently bogus and brittle. Specialists in collecting or producing the signatures appeared: the results were suspect and the authorities could always find enough fraudulent signatures to disqualify whom they wanted. So a reduction in the number required will be an improvement but better still would be to allow all registered parties to nominate a presidential candidate. Will the easier registration requirements apply in the presidential election? Not clear although one of his advisors is quoted as saying they will. If so, there could be a multitude of candidates competing for the “liberal” vote. This will have the benefit of demonstrating to Western observers infatuated with the parade of “liberals” that few of them have either support or programs. OTHER CHANGES. Putin has ordered web cameras be established at all polling stations immediately and transparent ballot boxes will be bought and provided. DEMONSTRATION. Another protest on Saturday; photos here, here and here. Clearly this one had a much bigger organised political party component. Two size estimates – 45K and 56K. 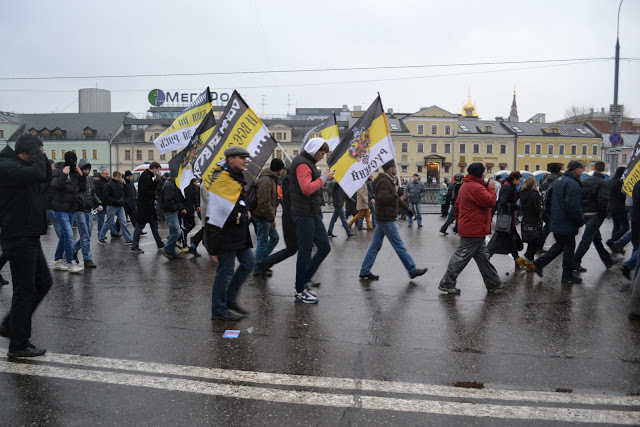 In short, a number comparable to the Boloynaya Square protest of two weeks before. Momentum is not building: indeed Levada shows that nearly two-thirds had participated in the earlier protests. By the way, there are other opinions demonstrating these days: here is a demo on the 17th. The first photo says it all: Stalin, Putin, Aleksandr III “Yes! Single Power”. WHO? Levada has done a survey of who was there and we can see the New Young People of whom I spoke last Sitrep (note that some questions allowed more than one answer). Men (60%), under 40 (56%), higher education (62%), self-described “liberal” or “democrat” (69%), heard of protests through the Net (89%), reasonably prosperous (68%). 20% hadn’t voted in the Duma election or had spoiled their ballot; 38% voted Yabloko, 19% Communist and 12% Just Russia. Only 37% had not protested the elections before. What were they protesting against? Falsified elections (73%) certainly but many responses show a generalised discontent with the way things are going. A solid majority want new elections, dismissal of the CEC head and punishment for fraudsters. Preferences for leaders are diffuse: about a quarter like Yabloko and Yavlinskiy but the remainder are well spread out. But there is a firm anybody-but-Putin stance. So, much as I suspected: young, educated, reasonably well-off and liberal. Putin’s children indeed but they’re tired of dad. ELECTION FRAUD. Still nothing that I have seen convinces me of game-changing fraud. Vedomosti, which was looking at polling stations in Moscow it thought were the most fraudulent has given up and confesses it has not found big fraud (Google translation) and has, weakly, fallen back on anecdote. 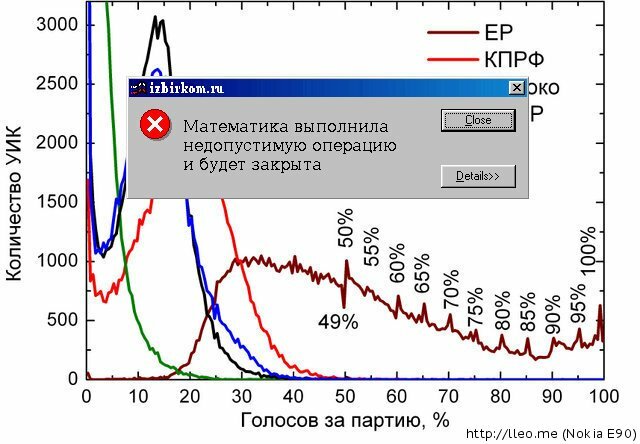 The Gaussian argument, popular in Russia, is fully discussed here and remains unconvincing. I reiterate: results in step with numerous opinion polls (in fact the ruling party did a bit worse than predicted) are strong prima facie evidence of reasonably accurate elections and need more than (partisan) anecdotes and credulous Western reports to contradict. Anatoly Karlin lists the various (and varied) opinions about the degree of fraud here. KHODORKOVSKIY. Bet this doesn’t feature in Western coverage. The Grand Chamber of the European Court of Human Rights rejected re-examination of the 31 May judgement that “incontestable proof” to back allegations of political motivation behind his first trial “had not been presented”. A long-winded way of saying that it found no evidence that it was politically-motivated. But the meme has been established. WTO. At last Russia is in. The overcoming of Tbilisi’s “veto” is further evidence of Saakashvili’s slippage. DEMONSTRATIONS. On Sunday there was a small (~500) nationalist demo, Monday saw 5-6K turn out for the authorities but the big one was Saturday’s. I am going with Alexandre Latsa’s estimates – he was there, took pictures and made a methodical estimate. He tells me he estimates about 25-30K at the maximum with many coming and going for a total over the day of maybe 50K. There were demonstrations around the country, so about 75K would be a decent estimate across Russia. Who were they? The photos show the usual oppositionists – disgruntled ex-officials, nationalists, Communists and so on – but also a lot of young middle class people who, presumably, hadn’t protested before. Latsa estimates that perhaps two-thirds were these young middle class people. For lack of a better term I will call these NYP – new young people. What generalisations can be made about them? They came to maturity in the Putin Age, have only childhood memories of the worst of the 1990s and none from the Communist period. They are, so to speak, Putin’s “children”. (Putin agrees). But children grow up and become independent. I suspect that they do not much fear change (I think many older Russians do). They are not especially representative of the population but every Russian city will have some. They are computer-savvy and linked together by the New Media: I doubt they pay much attention to TV newscasts. What were they protesting? Vote-fixing to be sure but they don’t look particularly angry in the photos. 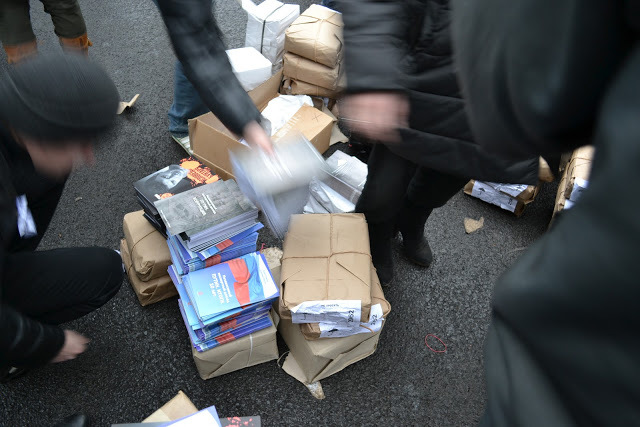 I am coming to believe that they were protesting not so much against counterfeit elections as against counterfeit politics: a protest against the Establishment; an Establishment that includes Zyuganov, Zhirinovskiy and the rest: beneficiaries of the stagnant political structure for two decades. They were saying you can’t ignore us any longer! This makes me more convinced that Putin’s decision to return was a bad one especially in the way it was done: a back-room agreement with Medvedev, announcement and servile approval from United Russia. I do not believe that the NYP have any interest in the familiar oppositionists, most of whom they would regard as tainted and – most tellingly – obsolete. I doubt that they have “leaders” (facilitators like Navalniy perhaps. By the way, there’s more to be known about him than The New Yorker tells). I believe that something new has been born but I don’t think that the NYPs or anyone else has any idea of what. I think “Putin’s Children: Flying the Nest” puts it well. It is worth noting, however, that it’s not that clear-cut – many of the people at Monday’s demo look like NYPs too. NYP POLITICS. It seems to be agreed that the NYPs have not taken much interest in politics before. Have they started to? and if so, who will capitalise on their new interest? Not, I suspect, anyone that we have heard of. But they may continue to reject politics and make their effect felt in some other sphere. Until polling data on the phenomenon appears, no one can say. A protest has been authorised for next week and we will learn more. ANTI-PUTIN? Is a protest against the mouldy political system – with which he has had a lot to do – a rejection of Putin the presidential candidate? At present he will be running against Zyuganov, Zhirinovskiy, Yavlinskiy – all surely more obsolete to an NYP than he is. Mironov is new to presidential elections but he’s Establishment too. Perhaps Prokhorov will be on the ballot but will NYPs rally around a plutocrat who made a fortune in the 1990s? I don’t think anyone has any idea what the NYPs will do in the presidential vote. FRAUD. I remain unconvinced that there was game-changing fraud on the part of United Russia. Vedomosti has been doing a recount in Moscow. After examining 294 “protocols” (the document from each polling station showing its results), starting with what it expected to be the worst, it claims to have uncovered 7456 United Russia votes stolen from other parties. As 294 protocols cover 440,000 votes at about 1500 each, this is not a very high percentage. And, because its investigation is already running into diminishing returns with fewer alleged stolen votes in each new protocol examined, the total votes alleged to be stolen will not likely rise very much more. Even if we accept – and double, or triple – these numbers, the alleged theft is a fraction of one percent of Moscow’s seven million voters. The non-Gaussian argument is declared here to be bad mathematics and the author proves his point by showing similar statistical effects from the latest UK election. (I especially recommend that you read him – Google translation). As always the North Caucasus stands out but minorities are amazingly skilful at maximising their presence at the centre where the cheques are written and it is prudent for them to pretend super-loyalty; pumping 80% up to 90% or 95% is again not game-changing. Exit polls do not impress me – too easy to fake or mis-sample. And the results broadly fit previous opinion polls. The preliminary results show United Russia down about 14 points, the Communists and Zhirinovskiy (who, to some degree, share an electorate) up about 10 points (to their combined level of the 1999 election, thereby reversing a gentle decline in their total since the high in 1993 when they totalled 35%). Just Russia is up about 6 points and the other three parties remain in the weeds, failing to cross the 7% entry barrier (or the coming 5% for that matter). Turnout is down about three and a half points. Given the way the calculations work, therefore, United Russia will have about 225 seats, well down from its 315 the last time around. It would seem therefore, that of the now-disgruntled former United Russia voters, some stayed home, some voted Communist or Zhirinovskiy and some voted for Just Russia. In any case, Yabloko and Right Cause – the “liberal” parties – did not profit. Putin & Co are victims of their own success. Yeltsin’s team tried to create “pedestal parties” to support him in the Duma – Russia’s Choice, Our Home Russia – but they were feeble attempts: hurriedly assembled, indifferent performers and soon forgotten. United Russia has proved to be more enduring and more successful. But it has the weakness of being only a pedestal for the Boss to stand on: its ideas are the Boss’; its members are the powerful and their hangers-on; its notion of creativity is waiting for the phone to ring. All deficiencies that Putin and Medvedev have complained about many times. This is not inspiring and it is clear that the population is tiring of it. Although it is worth pointing out that in any parliamentary system, 50% would be regarded as a major victory. But nonetheless a fall from two-thirds to one-half is not a vote of confidence. Putin and Medvedev are taking it calmly. Indeed, since the result accords well with opinion polls from many sources over some months, they must have known it was coming. Which raises, to my mind, the principal lesson that should be clear to everybody: Russian elections do, reasonably accurately, represent the state of feeling in the country. Of course there is fiddling at the edges, pressure is brought to bear and all the rest. But no country can afford to preach because no country runs a stainless system. But, as I and others have maintained for years, Russian elections do give, grosso modo, the state of the nation. In short, they are sufficiently free and fair. The anti-Russia league, for whom it is and always has been an unshakeable article of faith that Russian elections are phoney, will have great difficulty in continuing to claim that Russian elections are manipulated, decided-in-advance, shams created by the Kremlin to fool the simple-minded. Efficient dictatorships run efficient elections; even if they have to throw out the ballots and replace them with the “correct ones”. It is inconceivable that the cunning and evil master manipulator that they believe Putin to be would have manipulated the results so that his party lost 90 seats and its command of parliament. But I’m sure that they will try to save their theory, no matter how they have to twist reality. I look forward with amusement to watch them. ELECTION RESULTS. The almost final results give a Duma with 238 seats for United Russia (down 77); 92 Communists (up 35); 64 Just Russia (up 26) and 56 Zhirinovskiy’s party (up 16). (Interactive map by regions). United Russia will dominate, but no longer be able to bully. Which is a step in the right direction. ELECTION FRAUD. There is a lot from the usual media outlets about widespread, even game-changing, fakery. I would suggest that those who believe this reflect on what might be termed the Prime Law of Election Fixing: Don’t fix it so that your party loses votes and seats. Especially when they have been saying that every previous Russian election was fraudulent. This should be obvious to anyone. Secondly the results accord well (as previous elections have) with opinion polling (indeed United Russia did a bit worse). This piece shows that the results are consistent with numerous polls (here’s a reasonably perceptive forecast from two months earlier and another, based on polls, from the day before). To persist in assertions of game-changing fraud in the face of these facts is just ridiculous. By the way, if you go by the English-speaking media you would think that foreign observers thought the elections were frightful: not so, here are a number of foreign observers saying that they were good enough. The OSCE report does not suggest big-scale fixing either; indeed it reads like other OSCE reports: administrative resources, lack of competition, some bad behaviour. IMPLICATIONS. Half the vote is hardly a repudiation of United Russia but such a reduction is hardly an endorsement either. For some months opinion polls have been showing a weariness with this assemblage of power-worshippers. It is a wake-up call. I would expect more “retirements” of officials: not because they failed to cook the results but because they have been repudiated by the electorate. I do not believe that it will affect the presidential vote greatly (opinion polls again: The Team’s ratings are still pretty high) but it might/might result in Putin having to go to a second round of voting. On the other hand, given that the number two candidate will probably be Zyuganov of the Communists, it might not. However tired Russians may be of Putin, they must be even more tired of Zyuganov who ran for President in 1996, 2000 and 2008. To say nothing of Yavlinskiy (1996 and 2000) and Zhirinovskiy (1991, 1996, 2000 and 2008). Of these, Putin is certainly the least stale. But I still think he should have retired. At any rate both Medvedev and Putin are taking it pretty calmly; but, given the polls, they must have seen it coming. And, once again, the “liberals”, so beloved of the West, failed. 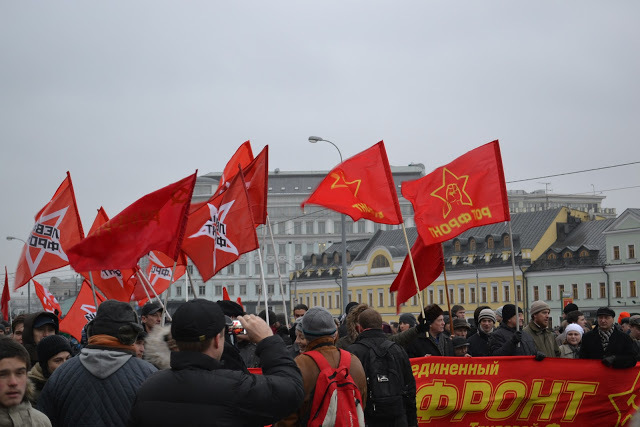 Here, as a change from “Putin stole it”, is a piece saying the Communists are back. CHECHNYA. Chechnya, again, produced a 99%+ turnout with 99%+ voting for United Russia. I actually believe this result is correct (plus or minus). Kadyrov’s father once said Chechens had been fighting for independence for decades without success and it was time to try some other method than war. I believe Chechens still want independence but understand that it would come at a terrible cost and then be followed by invasion by jihadists. This is, after all, what happened after the first war in 1994. It is therefore necessary never to let Moscow suspect that independence is what you are after (sovereignty is an acceptable public aim) but to move gradually in that direction. In this respect it is useful to be able to cover your moves by showing outstanding “loyalty” to Moscow. Chechnya is the sort of society in which the word can be put out through the tayps and families that it is in everyone’s best interest to turn out and vote for Moscow’s party. And something similar can be seen elsewhere in the North Caucasus where United Russia always gets big numbers. DEMONSTRATIONS. We shall see what Saturday’s demonstrations bring. MAGNITSKIY. The case was re-opened, we are told, so that his relatives can have his name cleared. NAVY. A task force, led by the aircraft carrier Admiral Kuznetsov, has left Severomorsk for the Atlantic and Mediterranean. Not, we were told last week, bound for Syria. Some attention has been paid to an address to the Russian people on 23 November in which President Medvedev set out Russia’s possible reaction should its concerns about the European Missile Defence system not be accommodated. For once, the Western media reported it reasonably accurately with most news outlets echoing the BBC’s heading: “Medvedev sees arms race if missile shield not agreed”. A conditional statement: if this, then that. Here is what Medvedev said. “Our only goal was to preserve the basic principle that Europe does not need new dividing lines, but rather, a common security perimeter with Russia’s equal and legally enshrined participation.” He reiterated Russia’s desire to build a “genuine strategic partnership” with NATO. But, he said: “Rather than showing themselves [NATO members] willing to hear and understand our concerns over the European missile defence system at this stage, they simply repeat that these plans are not directed against Russia and that there is no point for us to be concerned… But our requests that they set this out on paper in the form of clear legal obligations are firmly rejected… but our colleagues should understand that these obligations must have substance and not be just empty words”. Medvedev’s statement is obviously conditional: if NATO continues to ignore Russia’s concerns, Russia will feel that it must take steps to counter what it perceives as a threat. Russia is not “starting a new arms race”; it is saying that NATO is. Medvedev is saying if you continue to ignore our concerns, then we will have to respond. But, as Medvedev says, NATO insists that these defence provisions are not aimed at Russia. So why doesn’t he just accept NATO’s word? After all, the stated reason for European missile defence is, and always has been, the need for defence against potential “rogue states” with nuclear weapons and delivery systems. And the fact that no “rogue state” yet has such things does not counter the prudent reality that it is better to have a defence in place than find out too late that you should have had. So, how have we got into the position that Medvedev does not accept NATO’s word of honour? The answer is very simple: experience has taught Russia that NATO’s word of honour isn’t worth anything: “empty words” indeed. Here are two examples of the evanescent character of NATO’s promises. Moscow was promised in the Gorbachev years that NATO would not expand. How do I know that the promise was given? After all, nothing was written down. I know this because the US Ambassador of the period has said that the promise was made; I have been personally told by another NATO Ambassador of the period that the promise was made and “After speaking with many of those involved and examining previously classified British and German documents in detail, SPIEGEL has concluded that there was no doubt that the West did everything it could to give the Soviets the impression that NATO membership was out of the question for countries like Poland, Hungary or Czechoslovakia”. And how long did that promise last? Let us move to a more recent test of NATO’s trustworthiness. A UNSC resolution authorised NATO states and others to create a no-fly zone over Libya for humanitarian reasons: “to take all necessary measures to protect civilians under threat of attack in the country, including Benghazi, while excluding a foreign occupation force of any form on any part of Libyan territory” Within fairly short order this mutated into sustained destruction of Kaddafi’s forces and installations; then weapons were supplied to the rebels (so much for 13. “strict implementation of the arms embargo”) and special forces gave them training and directed the air attacks. In short, NATO aircraft swiftly became the rebels’ air force retaining only the hollowest pretence of the impartiality the Resolution implied. “We came. We saw. He died”. Regardless of whether NATO’s, probably decisive, assistance in overthrowing Kaddafi will be regarded as a Good Thing in the future, providing the rebel forces with an air force, weapons and special forces is very far from the UN Resolution that Moscow thought it was abstaining on. What was NATO’s word of honour worth in this case? Russia has no reason whatsoever to trust NATO’s mere assertion of intention. Here, from a Russian perception, are more examples of the worthlessness of NATO’s promises. But, really, the two examples of NATO Expansion and Libya, so important and so patent, are more than enough to show that NATO’s solemn declarations – how shall I put it – are subject to re-interpretation. I’m sure that Russians have an equivalent of the saying “fool me once, shame on you; fool me twice, shame on me,” NATO has fooled them more than once. If NATO really means what it says that the European missile defence scheme is not directed at Russia, why can’t it formally say so with a public, binding, signed statement to that effect? As long as it doesn’t, Moscow can be forgiven for thinking that it’s just another in a series of NATO promises that will be casually discarded at some later date. As George Kennan said, in 1998 of NATO Expansion: “I think it is the beginning of a new cold war… I think the Russians will gradually react quite adversely and it will affect their policies. I think it is a tragic mistake. There was no reason for this whatsoever. No one was threatening anybody else.” Not for the first time, “Mr X” got it right.